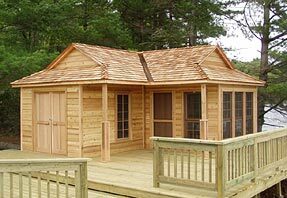 This compact 12 x 18 cabin has an 9 x 18 enclosed space with a 3' porch. The screenroom is 9 x 12 with a 9 x 9 enclosed space and a 3' porch as well. The screenroom features "boathouse" style vertical folding windows that can be raised and folded out of the way to maximize airflow in the screenroom wing.